Claire's travel blog, cause you asked for it. It's your standard Los Angeles story; every year, the area catches fire and imperils dozens of expensive homes, forcing evacuations and painting the night sky reddish orange. But this is the first year I've been here to see it, and they're saying the Station Fire is actually much larger and spreading much faster than some of its other compatriots. 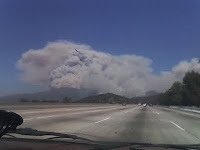 We first noticed the fire this early afternoon, when Justin had a doctor's appointment in Montrose, which is several miles east of us in the Valley; driving over there, we saw volcanic clouds of smoke, tinged with pinks and oranges. 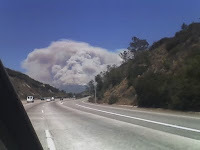 As we drove closer, we saw the occasional tiny flame gouting upwards, and the fine sifting of ash drifting past the office doors. As the day progressed, more flare-ups. The fire started to trickle down the hills towards the San Fernando Valley, closer to Pasadena and Glendale than most people would be comfortable with. We watched the bright orange flames spurt upwards, and the constantly circling firefighting airplanes return again and again to drop payload after payload of fire retardant water. The payloads seemed so small compared to the riotous size of the blaze, which is cresting this hills, dipping down towards the houses. Occasionally there is a brighter-than-usual flare, with deep orange flames and darker smoke; that is a house, or something that's not brush, catching and burning. The temperatures today were about 106 degrees, and the firefighters are wearing full protective gear; they have to, because the fire is so hot. I suggested bringing marshmallows up to the firefighters, and Justin suggested they be shaped like priceless heirlooms. As night fell, we watched the sky glow in so many places, edging the hills with red and orange, and the creeping bright yellow flames dipping down towards the edges of Pasadena. The smoke is everywhere. Time lapse video of the Station fire smoke plumes.